A new generation of smart packaging - which flags up when food is going off - is being developed in Glasgow. Researchers from Strathclyde University are working on indicators made from "intelligent plastics" which change colour when food loses its freshness. They hope to have a commercially viable product available soon which will improve food safety and cut waste. The project is being supported with £325,000 in funding from the Scottish Enterprise Proof of Concept programme. UK households are estimated to throw out about 8.3 million tonnes of food each year - most of which could be eaten. It is also thought that there are about one million cases of food poisoning annually in Britain. The Strathclyde University team hopes new smart wrapping will alert consumers when food is about to lose its freshness because it has broken or damaged packaging, has exceeded its "best before" date or has been poorly refrigerated. Freshness indicators currently used across the food industry usually take the form of labels inserted in a package but these come at a significant cost. Strathclyde researchers are looking to create a new type of indicator which is part of the wrapping itself and subsequently much cheaper. The indicator it is working on will change colour when the freshness of the food deteriorates past a certain level. 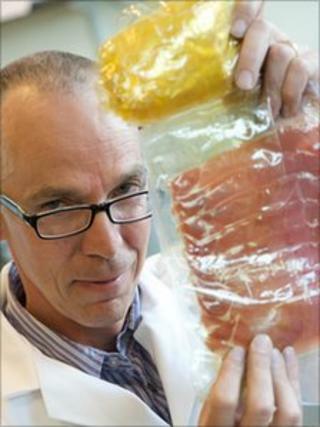 It will be used as part of a form of food packaging known as modified atmosphere packaging, which keeps food in specially-created conditions that prolong its shelf life. Professor Andrew Mills, who is leading the project, said: "At the moment, we throw out far too much food, which is environmentally and economically damaging. The Strathclyde team believes its work could resolve potential confusion about the different significances of "best before" dates and "sell-by" dates. It could also help to highlight the need for food to be stored in refrigerators which are properly sealed.